Located on one of the most desirable streets in the Lakeside High School footprint. Walk to Leslie Beach Swim and Tennis Club. Walk/bike to Henderson Mill Elem (STEM) and Henderson Middle School. Two story home with finished terrace level and main floor bedroom and full bath. Renovated Kitchen and baths. New roof and paint. Hardwood floors on main floor and all second floor bedrooms. Sunroom, two-level deck and fenced backyard. Security gate with remote control. Henderson Mill Elem (STEM,STEAM) has high parent ratings. 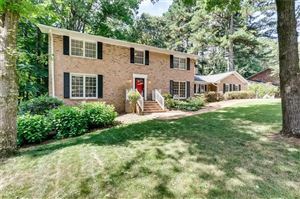 Convenient commute to Emory, CDC, CHOA.